The N200-015-BL Cat6 Gigabit Molded Patch Cable ensures ultra-fast performance throughout your Cat5/5e/6 network application. It connects high-speed network components like computers, printers, video game systems, Blu-ray players, copy machines, routers and modems in a home or office Cat5/5e/6 application. This 15-foot blue cable is designed for 1000Base-T (1 Gbps Ethernet), 10/100Base-T (Ethernet), 100 Mbps TPDDI, 155 Mbps ATM, ISDN, voice, Token Ring Type 3 and EIA/TIA applications. Manufactured from 24 AWG 4-pair stranded UTP with a staggered-pin plug design and male RJ45 connectors, each cable provides high-speed connections up to one Gbps and flawless signal delivery, while keeping near-end crosstalk levels to a minimum. Featuring a PVC jacket, the N200-015-BL is constructed of top-quality materials for long life and durability. Copper contacts are gold-plated to ensure an accurate signal transfer. Molded integral strain relief guarantees a secure connection. Meets most current industry standards, including IEEE 802.3ab, IEEE 802.5, ANSI/EIA/TIA 568, ISO/IEC 11801 and ETL (category 6 draft 11). 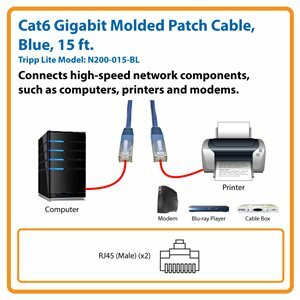 Cat6 Gigabit Molded Patch Cable (RJ45 M/M), Blue, 15 ft.
Tripp Lite’s N200-015-BL ensures ultra-fast performance throughout your Cat5/5e/6 network application. It connects high-speed network components like computers, printers, video game systems, Blu-ray players, copy machines, routers and modems in a home or office Cat5/5e/6 application. This 15-foot blue cable is designed for 1000Base-T (1 Gbps Ethernet), 10/100Base-T (Ethernet), 100 Mbps TPDDI, 155 Mbps ATM, ISDN, voice, Token Ring Type 3 and EIA/TIA applications. Manufactured from 24 AWG 4-pair stranded UTP with a staggered-pin plug design and male RJ45 connectors, each cable provides high-speed connections up to one Gbps and flawless signal delivery, while keeping near-end crosstalk levels to a minimum. Featuring a PVC jacket, the N200-015-BL is constructed of top-quality materials for long life and durability. Copper contacts are gold-plated to ensure an accurate signal transfer. Molded integral strain relief guarantees a secure connection. Meets most current industry standards, including IEEE 802.3ab, IEEE 802.5, ANSI/EIA/TIA 568, ISO/IEC 11801 and ETL (category 6 draft 11). The N200-015-BL comes with a lifetime warranty. It’s manufactured in compliance with strict RoHS specifications, reflecting Tripp Lite’s commitment to environmental responsibility. N200-015-BL Cat6 Gigabit Molded Patch Cable, Blue, 15 ft. Founded in 1922 in Chicago, Illinois, Tripp Lite is a leading manufacturer of products to power, protect, manage, house, cool, connect and mount your equipment. With a large selection of connectivity products, Tripp Lite has everything from USB hubs and reversible USB cables to fiber-optic cables and over Cat5e/Cat6 signal extenders. Whether you need to connect high-speed networks to switches, routers and servers in your data center, or send high-resolution video signals to displays and digital signs, Tripp Lite has the complete solution. Plus, before and after your purchase, our Chicago-based, in-house technical support specialists are available to assist you by phone, email and live chat. With over 90 years of quality products and service, Tripp Lite is a brand you can trust.